Castle Villa AFC despatch Kildare Town. Castle Villa AFC are defeated by Kilcock Celtic. Kilcock Celtic has yet to be beaten in this competition, having won every game. Castle Villa AFC take spoils against Clane United. 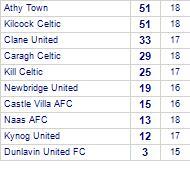 Clane United has yet to win in this competition, having lost all 3 games. Moone Celtic claim victory against Castle Villa AFC. Castle Villa AFC has yet to win in this competition, having lost all 4 games. Castle Villa AFC are defeated by Prosperous United. Sallins Celtic take spoils against Castle Villa AFC. Kynog United lose to Castle Villa AFC.